One of the US tech industry’s most iconic pieces of advertising is about to become history as the Yahoo billboard is San Francisco was revealed to be coming down in a report from the San Francisco Chronicle. 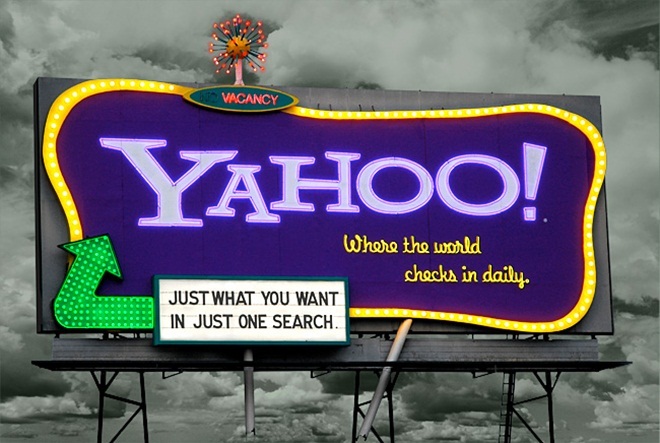 The motel-style billboard has running for more for ten years after first going up in 1999 during Yahoo’s prime, just five years after Jerry Yang and David Filo had founded the company. Despite being a much recognised and symbol piece of the tech landscape — having graced the front covers of Forbes and Fortune — the billboard space, which has been regularly updated and changed over time, will be available to rent in just two weeks for a cool $65,000 a month, or $80,000 if the neon is used. The man who helped the billboard come to be, Robert Boyce, who was Media Director at Black Rocket — one of Yahoo’s early PR and marketing agencies — revealed how it took a year to find the right board in spite Yahoo’s initial disinterest. Although our client [Yahoo] had no interest in doing an outdoor “campaign”, I had been wanting to find something special for them – a board that could serve as a physical presence. At the time I had no idea what that may turn out to be creatively, but I was working with some of the best talent in that area, so I just focused on finding the board. I made all of the companies aware of my desire and waited about a year for the right board to come up. That is how rare it was at the time to get a chance at a really good board. Bringing down the board is the end of an era in its own right but the move is an apt a metaphor for the change in focus rumoured to be considered at Yahoo. The company has been strongly linked with selling off parts, or all, of the company and, like the sign, things could be set to change for another US tech icon. Update: this isn’t the only retro-styled billboard Yahoo has dropped. As this website shows, the company once had the signage below in New York’s Houston Street, where it featured from sometime in the late 1990s until 2003. Hat tip to Robin Moroney for the New York information.